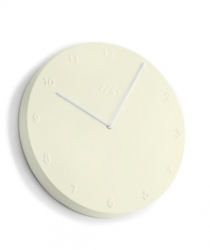 The Danish designers, Birgitte Due Madsen and Jonas Trampedach, have created the new ceramic wall clock Ora. The design is uncompromising and modern with no unnecessary details. Ora's purity makes it a stylish and functional object which is both masculine and feminine in its expression. The inspiration for the simple, ceramic clock face arose from a fascination by the flexible and shapeable material. The colored dials and the numbers, that cast shadows along the edge of the circle completes the clocks beautiful and stylish appearance.